I purchased a small dog/ animal over the head harness at Target and tried using it ok my piggly however her leg slipped through the neck and belly strand choking her. It was quite an ordeal. Did you specifically buy a pig harness or did you use a dog or general small animal harness? She also hates her harness even with treats its a struggle. Hi Paris! So far we have only used dog harnesses on Oscar, and I haven’t found one that’s a perfect fit. I need to break down and finally buy him a pig-specific harness because we’ve had fit problems with all of the dog ones. Now that Oscar is a little older and less wiggly, I use the step-in ones for around the house and the over-the-head ones for when we travel or when I need a more secure fit. The step-in ones are easier for me to get on him now that he’s not a wiggly piglet, but he can slip out of that kind really easily. The over-the-head kind is more secure on him and he’s less likely to wiggle out, but he’s a little fussy about putting that one on these days since we don’t use it as often now. Getting Oscar’s harness on him has been easier with time, but he still doesn’t love putting it on. He’ll grunt at me a bit just to express his disapproval but at least will stand there and let me put it on him. I don’t think he’ll ever like putting his harness on. But, once it’s on him, he doesn’t seem to care at all and wears it around without complaint. If you need a more secure harness, you might try one of the pig-specific ones. There are more and more being made these days, so that’s a huge plus and people seem to like them. The harness process does get easier, but I feel your pain because I used to dread putting Oscar’s harness on. I finally broke down and bought a pig harness from amazon due to dog harnesses never fitting g correctly (they are shaped differently) and I’m so glad I did. It has buckles for the neck & back so I can basically fling it over his back and no more forcing it over his head or trying to get him to step into it.It’s great, I use to have to fiddle with his harness for a minute or so to get it on now its 10 secs and ready to go! I look at your page a lot about tips and info on how to deal with my mini pig Harley. Harley’s gotten to the point where he’s fine with putting the harness on as long as he gets a treat, but I’m still have trouble with him walking on the leash. I’ve only had him for a little over a month, so I know it’s something that will take time. However, I was wondering if Oscar is leash trained? And if you had any tips or advice on how to help Harley get used to his harness and leash and walk with me? Thank you!! Hi Shay! Oscar is somewhat leash trained. Since we’re in the country, I mainly just let him roam around the yard on his own, so I haven’t worried too much about actually leash training him. If he’s going somewhere he wants to go or isn’t distracted by grass he wants to eat, he is good on a leash and moves where I need him to. If there’s a patch of grass he wants to stop and root in or eat, all bets are off and I’m left tugging him along until he forgets about the grass and moves on. One thing we did in the beginning that I recommend trying is to put Harley’s harness and leash on in the house and just let him roam around. This takes any fear of the leash away and also keeps him from equating the leash with loss of freedom. It won’t do much for actual leash training, but it’s a great way to get him to not mind the leash before you start the real training. Also, when you start training, remove distractions as much as possible, so go somewhere away from grass that he loves to eat or anything like that so that he can focus on just moving with you. One reason I haven’t focused too much on Oscar’s leash training is that I’m a bit skeptical that they can be trained to move on a leash as well as a dog can. I might be completely wrong on that, but I think you just do the best you can with pig leash training. When I’m desperate and absolutely can’t get Oscar to move, I get behind him and nudge him with my feet (almost in a “move the pig” way) and he will usually move right along and past the distraction enough to get going again. The best thing is to just keep at it and try to move him past distractions and keep him by your side as best you can. Hope that helps! Hello, my mini pig Daisy refuses to let me put on any harness with or without treats. We have tried many harnesses for her and she either doesn’t like it or she’ll slip out of it. And we have had her for a little over a week now, and no matter how we try to pick her up or hold her, she squeals but eventually after well so just stop. We have tried the way you provided, but she still squeals. I’ve tried treating her while holding her but it seems to make her more angry or aggressive l. Sometimes she bites. What do I do? Hi Skyler! This is such a tough part of starting out with a mini pig. One thing I don’t think I mentioned enough in the video is that, even if you hold her “correctly,” she will still squeal until she’s used to being held. It’s more of a training process than a fix. So, don’t worry that you’re doing something wrong because she’s still squealing. I can’t remember how long it took us, but I think it was a few weeks to a month of holding Oscar through the squealing until he was finally more comfortable being held. Some days are easier than others. The important things are just to keep up what you’re doing (maybe pick up some ear plugs…haha) and don’t give in and put her down. This is one of those things that unfortunately just takes time, but she will get better with it. If she’s getting aggressive with the treating, I would stop trying to give her treats and just hold her. You don’t want to accidentally give her the message that throwing a fit or biting gets her treats, so only give her a treat once she’s calm and quiet. If possible, try to hold her into your body so that you have a good grip on her and see if you can hold her in a way that keeps her from trying to bite. Unfortunately, it’s not completely uncommon for young pigs to try to do that, and it’s important for you to “win” those battles and for her to not think that biting or squealing is the way to get what she wants. With the harness and with holding her, just keep at it. I got to where I hated putting Oscar’s harness on or trying to pick him up, but both of those things do get easier once they’re more used to it and once they’ve learned that you’re going to do it no matter if they squeal or throw a fit. Sorry you’re having trouble with it, but it will get easier! Do you have a recommendation of a brand or website for harnesses for a micro pig? 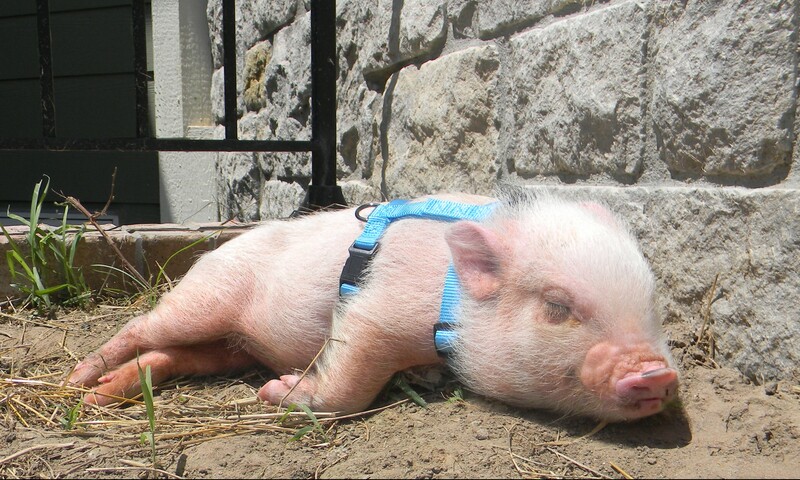 I ordered one harness that is an over the head harness for my 10 week old micro pig. She is very uncomfortable in the harness. She backs up, flips over, and squeals. She only goes backwards in the harness and flips over a lot. I hope this is normal in the beginner and nothing is wrong with my piglet. Hope you have some input to help guide me in a direction to order a harness that worked for you. Thanks. piGGlz.com sells harnesses designed for pigs. I bought one for my Annabelle and we both love it. Well I do! She wears it often and has learned to walk on a leash easily. While I don’t have a micro pig, I do have a regular sized potbelly piggy, Nova. We got her about a month ago when she was already about four or five months old (her previous owner wasn’t too sure). We’ve tried numerous harnesses, collars and even used a leash (where you put it inside the handle and it tightens itself) in an attempt to get her used to walking. With every harness she always managed to find a way to put her legs through, which she even did with a collar and the leash too. The one harness that did fit her perfectly with no problem at all, she freaked out and threw a fit (when she realized she couldn’t get out so easily) until she finally got her legs through forcefully. I’m not sure what else to do or what else to try, is it maybe a bit too late to harness train her? i just got a mini pig and every time we put her step on harness on her, she starts jumping in circles and squealing. This makes taking her out to go potty an ordeal. Do you have any tips for what I should do?